Assistant Professor of Media Culture at the College of Staten Island (CUNY), C.W. Anderson, chaired a panel of academics from universities across the U.S. and Canada discussing the importance of community in the news today at the 14th annual International Symposium on Online Journalism. Four experts presented their findings from research conducted on a particular topic pertaining to the evolution of journalism during a discourse entitled “Not Your Typical News Audience-Anymore.” Each presentation discussed information primarily concerning the dissemination of news through the use of social media. Avery Holton of the University of Texas presented the third paper that is best summed up by its title, “Soliciting reciprocity: Socializing, communality and other motivations for linking on Twitter”. The main questions his study asked was,“what motivates people to post external links in their tweets?” His findings revealed eight motivating factors that answer this question –information seeking, information sharing, interpersonal utility, convenience and entertainment, passing time, social support, control and promoting work, and communal reciprocity. Communal reciprocity is the key influencer behind not only linking on Twitter, but why it is such a common news source. Holton compared linking on Twitter to butterflies trapped in a jar; the best way for a full story to be released (or read) is for it to be circulating among a community on social media. 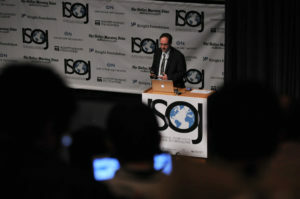 ISOJ 2013: Avery Holton presents his research during the “Not Your Typical News Audience – Anymore” panel from Knight Center on Vimeo.